Gswede Sunday: How's your Team? The San Antonio Spurs have 5 championships and 17 consecutive years of making the basketball playoffs; the longest current streak by far in the NBA. The high flying Atlanta Hawks are a distance 2nd at only 7 straight playoff appearances. Why are the Spurs the envy of many? Great team chemistry, Family oriented, Integrity and a Strong infrastructure come to my mind. Yes, they got lucky with having a great “Hall of Fame” player (Tim Duncan) and one of the best coaches (Gregg Popovich) on any level, but that alone can't give one success. Also, luck usually comes to those who are prepared for it, not those who wish for it. In addition, they have the wisdom to draft and develop foreign born players, which has been integral to their success. Most I know, who consider themselves successful, not surprisingly, have a good/great team (family, friends, mentors, colleagues, etc) around them. Most importantly, they have a strong infrastructure and leader, with an inner circle that offers members the opportunity to thrive. A few have spoken lovingly to me about how fortunate they are. From my experience, those who aren't where they want to be in life or are struggling, usually lack that coherent teamwork and/or infrastructure - typically having close connections or family or friends who bring them down or don't add value. In my opinion, people who don’t add value or fail to enhance your life, shouldn't be in your world, no matter how good the convenience or short term pleasures might be. For 2015, my hope for those with strong teams is to monitor them with an eagle eye, especially if you are the leader. Never take that blessing for granted. If you are lacking a decent team, DO something about it! Good teams don't magically appear and take lots of intelligence, wisdom and hard choices to build properly. If the foundation, focus, makeup and harmony of your current team isn’t at least close to good, life will more often than not, continue to disappoint, just like the Spurs opposite, the NBA’s New York Knicks – a franchise in massive disarray for the last 12+ years and counting. 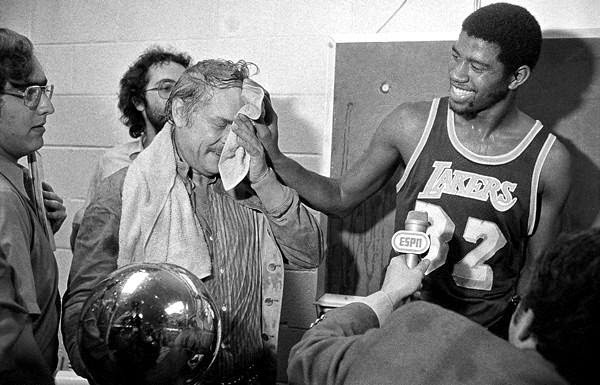 Magic and Dr. Buss - The start of many great Laker teams! Great food and great people with awesome styling and interior. Also great event locations with cheap happy our drinks. However, the downstairs beer selection is about as standard as it can be while upstairs can be a bit more creative.